Frederick’s father, Leonard, was a farm labourer from Chisbridge Cross near Marlow and his mother Alice was from Rockwell End. After their marriage they lived at Wood End, Medmenham. Frederick was born in Horton in mid-1894. By 1901 the family was living at Victoria Cottages, Horsemoor Green, Langley. Frederick became a gardener and in the 1911 census, he was working at Ditton Park, giving his address as The Gardens there, presumably living in workers’ accommodation. His parents were also living at Ditton Park, at London Lodge, with Frederick’s three sisters: Ellen, born in 1899 in Stoke, Slough; Beatrice Annie, born in Langley c1903; and Hilda Alice, born in Stoke, Bucks, c1910. Frederick joined the 1st Battalion of the Grenadier Guards, as Private 15843. He joined the military before the outbreak of war. There is a website, Army Service Numbers Blogspot, which lists army service numbers by date. This indicates that Private 15795 joined the battalion on 26 March 1912 and Private 16247 joined on 25 January 1913. Based on this information, it would suggest that Frederick, as Private 15843, joined the battalion at some point between those dates. Frederick returned to the Front and survived until 10 March 1915 when he died from his wounds. His Soldier’s Effects document, part of his military records, gives his place of death as No 26 Field Ambulance which suggests he may have died on the same day as he was wounded, on his way to hospital. In The Grenadier Guards in the Great War of 1914-1918, which is available to read on the archive.org website, Lieutenant Colonel The Right Honourable Sir Frederick Ponsonby, late Grenadier Guards, provides a detailed account of each battalion’s movements. This gives an indication of what Frederick might have experienced in February and early March 1915. “February found the [1st] Battalion still in the same trenches which had by now been greatly improved. The problem of the water had been partially solved and the men were able to take some pride in their trench line. There was a certain amount of sickness with occasional cases of influenza. A motor ambulance, presented by Captain J A Morrison to the Battalion, arrived, and while the officers and men much appreciated the gift, the Medical Authorities were much concerned at the irregularity of the proceeding. “There had been a certain number of casualties among the men from sniping and shell-fire, but the greater part of the losses were from sickness. On March 3, the Battalion was relieved by the Canadians, and billeted in the Rue du Bois. It marched the next morning to Neuf Berquin, and on the following day to Estaires. On 10 March [the day Frederick died of his wounds] it joined the rest of the 20th Brigade, which was on the main Estaires to La Bassée Road. Datchet Parish Magazine carried details of Frederick’s death in the May issue. 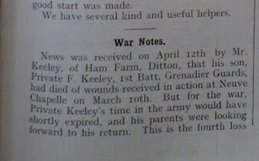 This read: News was received on April 12th by Mr Keeley of Ham Farm, Ditton, that his son, Private F Keeley, 1st Batt, Grenadier Guards, had died of wounds received in action at Neuve Chapelle on March 10th. But for the war, Private Keeley’s time in the army would have shortly expired, and his parents were looking forward to his return. 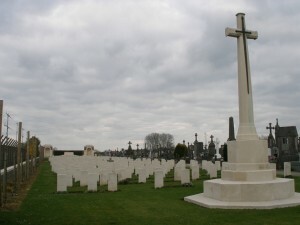 Frederick has a grave at Estaires Communal Cemetery. He was buried in Plot III, Row D, Grave 10. The town of Estaires was occupied by French cavalry on 15 October 1914 and passed at once into British hands. The town was a Field Ambulance centre so the ambulance carrying Frederick may have been on its way there when he died of his wounds. Frederick was awarded the 1914 Star, Victory and British Medals. His records list him as a Guardsman; the rank of Guardsman replaced that of Private in all Guards Regiments in 1919, an honour awarded by the King in recognition of their great effort during the War. The military records list Frederick as a resident of Datchet. The last known address for his parents was 20 Ditton Road, Datchet (now renumbered as 40 Ditton Road).